It’s somewhat odd that Microsoft would choose this time to highlight this program. The Windows Feedback Program, after all, has been running for years already. Indeed, the sign-up for the Feedback Program is from 2009. 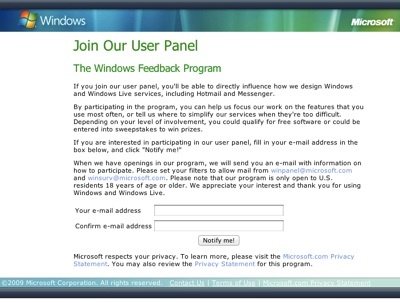 While the sign-up form specifically mentions that volunteers will also be asked to provide feedback about Windows Live, including Hotmail and Messenger, today’s announcement puts the emphasis on Windows 7 and 8. Chances are that the company is mostly making this appeal today because it is looking for more data about the Windows 8 user experience (a user experience that could definitely still use some work). It feels like it is rather late in the Windows 8 development cycle to ask for this kind of data now, though.